After two years into retirement and having undertaken some wilderness trips with my canoeing buddies into the northern regions of Algonquin Park, I felt that it was time to ask my wife, Geri, to accompany me on a camping trip to the High Falls and Barron Canyon region of Algonquin Park. As walking is Geris passion, I threw in a promise of some interesting hiking trails as an enticement. Over the years, Geri has patiently endured stories of my trips as well as assisted with the editing of my stories for publication on Jim Hegyis website, so I wasnt surprised when she accepted the challenge. July 15  Our gear was packed into the car the previous night, leaving only the canoe to be secured on top of the car and our food supply to be put into coolers in the morning. As we departed, sunshine, light clouds and a cool breeze were great indicators of a fantastic day ahead. At the Sand Gate Station, park staff cheerfully welcomed our arrival. Upon registering, and to our surprise, we were informed that a better campsite was available and that we would not be disappointed if we decided to take it. After travelling for 25 km on a dirt road that led us into the interior of the park, we arrived at the Achray Campgrounds and were confronted with a campsite that was situated under tall pine trees with a sandy beachfront facing Grand Lake and the promise of some beautiful westerly sunsets. We soon experienced the antics of two squirrels who became known as "Chip" and Dale". 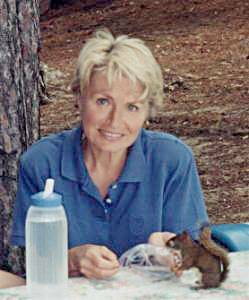 When we stopped for a quick lunch before setting up camp, the squirrels got right beside Geri and patiently waited to lick the remains of the jam and peanut butter from the zip-loc bag. With our campsite finally put in order, I took the first opportunity to go for a refreshing swim in the lake. Later, we canoed the shoreline to familiarize ourselves with the area. 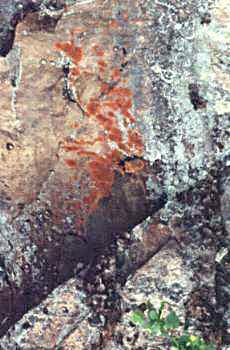 By 2pm, we decided to cross Grand Lake in search of the native pictographs on one of the many ledges leading into Carcajou Bay. 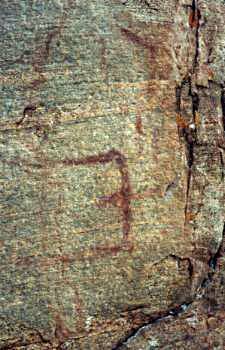 Undeterred from not locating any, we retraced our route and finally found, what we later learned from a park employee, was the one and only pictograph on a rock surface near the waters edge a reversed letter "F" in red-ogre with faint markings surrounding it. As we were about to enter a wetland, we approached two lone baby loons and soon caught sight of their frantic parents shrieking and rushing to their protection. We paddled slowly to allow them ample time to distance themselves from us. Although the bay was very active with various waterfowl, such as the red headed merganser duck and the mallard, the lily pads with their white and yellow flowers touched the area with serenity. Leisurely following the shoreline, we came upon a family of four fishing. They had just caught a small bass and placed it upon a rock where the fish was immediately eaten by a water snake. 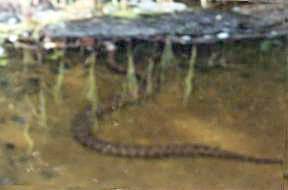 The snake could be seen entering the water among the rock crevices and then swimming towards the edge of the canoe with its head just above the surface and its body markings very distinct in the clear water. As we continued down the lake, the scent of various coniferous trees and flowers was very prevalent and in one particular area, there was a strong fragrance that resembled strawberries, but none could be seen. We passed two campers sitting at their site overlooking and enjoying the peacefulness of the lake  to us this was what it was all about. We crossed the lake to take a closer look at the Brant cottage located on a high, rocky isthmus  a perfect place to spend summer vacations. We found the waters of Grand Lake to be extremely clean - due in part by the abundant plant life along the shore, the clams found on the sandy lake bottom and the parks conservation program. After three hours of paddling, we returned to our camp to swim and later enjoyed a leisurely walk about the campground - to our delight, we noticed a beautiful Baltimore oriole in a large pine - a bird that is not very common to the backyards of Ottawa. A pleasant park employee informed us that the log cabin situated next to the stone administration building was the one used by Tom Thomson, a Group of Seven Canadian artist, who frequented Algonquin Park during the early part of the 1900s until his death in a canoeing accident. 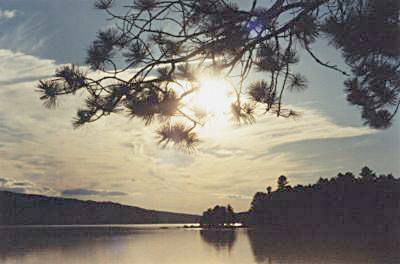 On his suggestion, we later visited an area of Grand Lake where Thomson painted his famous "Jack Pine" scene. After a late supper, we sat around our campfire and enjoyed a chorus of loons, bullfrogs and whipper wills as the sun began to set. The rolling hillside across the lake and the blue sky lined with scattered clouds reflected beautifully upon the still lake, resulting in a very picturesque scene. 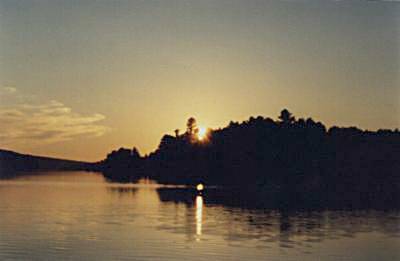 I took the canoe out onto the lake for a final view of the setting sun - it was evident another warm summer day was in store for us. By 10:30 pm, we were snuggled into our sleeping bags; however, sleep didnt come easily for me as I was only too aware of the constant calls of the loons, the bullfrogs croaking in a cove next to our camp, and the screaming of countless gulls on an island in the middle of the lake. Geri, however, was completely undisturbed and slept soundly.